I Have A Dream! Those are very powerful words. They first entered the consciousness of a nation on a day in 1963 when a little known preacher called Martin Luther King stood up on the steps of the Lincoln Memorial and addressed hundreds of his followers saying ….. I Have a Dream…..and he shouted it out for all the world to hear and the world heard and paid attention. Some laughed and some snickered and some ridiculed this African American who dared to put his dream out to a nation. Martin Luther King was not afraid to let the world know he had a dream! It was a big dream! You have a dream! And so do you! And you, and you! Each and every one of you has a dream. I too have a dream. I can guarantee that each and every one of you have a dream or many dreams that you hold near and dear to your heart. Dreams are very special. They are our imagination showing us a vivid picture of what we can achieve. What we can become, if we only BELIEVE in ourselves, if we allow ourselves the confidence to go forth and achieve our dreams. Dreams and imagination go hand-in-hand. You cannot have a dream without having a vivid picture in your mind (imagination) of what you intend to bring into your life. Dreams are exciting, the adrenaline flows and your manifesting vibration rises like a hot thermometer. Years ago I worked in an agency that helped women who had their dreams stolen and denied them. It was heart breaking to watch. It was then that my dream started to grow of working with women, mentoring and empowering them to become more than they ever thought possible. It became very real to me. I nurtured and protected that dream. My dream required training and as a mature student I went after each and every course with fire in my veins knowing in my heart that I was following my Dream. Many people in my immediate circle thought it was all due to my age and I needed to prove something. Looking back in hindsight – I was really re- defining who I was, and what I wanted to do with the rest of my life, and most importantly, I was following my heart! It is imperative, when you have a dream, you nurture that dream. When you feel that passion and urge within you to go out and give birth to your dream, it is very important that you follow your heart and afterwards your head will guide you. The linear side of your brain will kick in to work out the details for you. What I have experienced over the years is that when we have a dream. Unseen forces transpire to assist us in realizing that dream. People, opportunities and experiences will appear in your life just when you need them. I remember going through the aisles at the local library with my list of resource materials needed for one of my seminars. As I stood pondering where next to look, a book fell off the shelf at my feet. When I picked it up I was shocked, then thrilled and speechless. It was just what I needed. Not what I thought I wanted! When you have a dream, a goal, a vision, and a focus – something you feel will give your life meaning. Choose to follow that Dream. 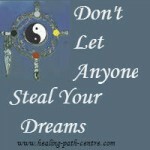 We are never given a dream without being sent the support and the resources we need to manifest that dream. Keep a Dream Journal and surprise yourself when you visit it a couple of years from now (Today they call it a Bucket List) and see how many of those dreams you have achieved. The Dream is the Vision. Keep Focused Attention on your Intention (Dream) and life will conspire to bring it into your reality. Dreams are thoughts. Thoughts become things. They are the first step in the creation process. Thoughts create our reality. There is a saying. “As a man thinketh, so he becomes.” Think it into your reality – the universe will deliver!